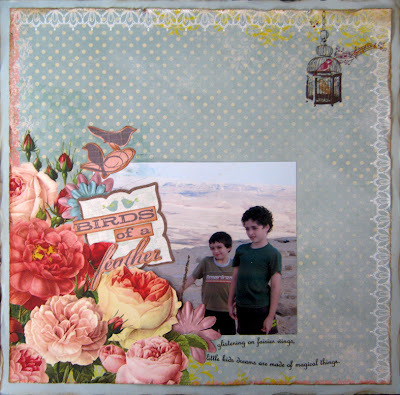 scrappin it: Flowery layout…for boys! I often hear that designing layout for boys is less fun, because you can't use flowers. "It's too girly" is the popular sentence I hear in most cases. Well, I want to say WRONG! It's not true! You can and should use as many flowers as you want on boys and men layouts. Here is one example for such a layout that I did as a DT layout for My Punch. Don't be scared! Try making a flowery layout for your guy/s. Just before we part I have an exciting announcement! On April, both I and my blog celebrate our birthday, so in honor of these important occasions I will have a mega giveaway, full of goodies and surprises!! Want to know more? Tune in on Friday. You are right - who say flowers are bad for boys! Great layout! אכן! סוף סוף מישהי עם ביצים...מספיק עם השטויות האלה של לא לשים פרחים לזכרים מכל גיל... יופי! ועכשיו הודעה חשובה: אני לאט לאט משתדלת לעבור לגוגל רידר, אני לא מפסיקה לקרא את הבלוג שלך, רק מעבירה אותו לשם! לא להפגע או משהו כזה. אני נשארת עם העיצובים שלך!! !